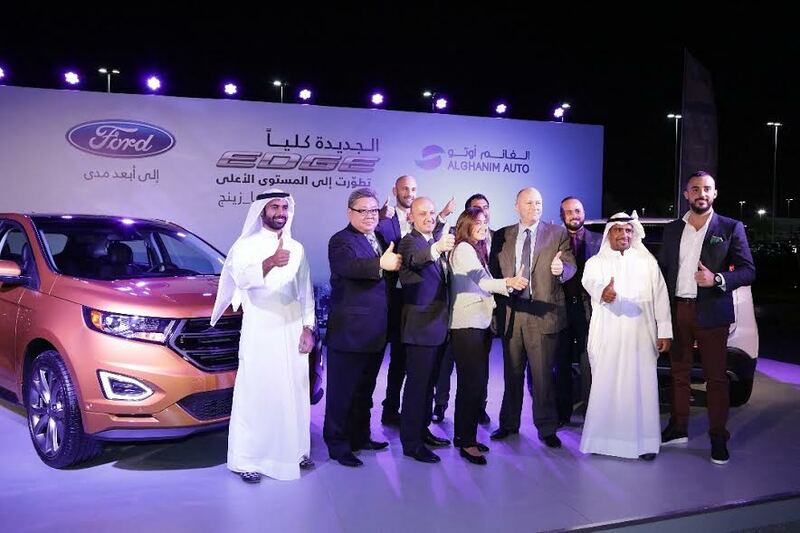 Kuwait: The All-New Ford Edge was officially introduced in Kuwait, marking an important milestone in the newly founded partnership between Ford Middle East and Alghanim Auto. Available now at the new Alghanim Auto Ford showroom in Shuwaikh across from SIRBB Circuit, the All-New Ford Edge demonstrates what happens when a proven leader gets even better. In its 3rd generation, the new model features an impressive lineup of powertrains, class-leading technologies, higher levels of craftsmanship and greatly improved vehicle dynamics, guaranteed to impress drivers at first sight and test drive. In the presence of the local media, social influencers, and an audience of evening goers, the launch event was held at Murouj and commenced with welcome speeches by Tim Zimmerman, Vice President, Alghanim Auto, and Mohammed Al Houssami, Regional Sales Director, Ford Middle East. When launched in 2007, Edge helped to define the crossover sport utility vehicle segment. With a car-based design, Edge delivered better on-road comfort, fuel efficiency and overall driving dynamics than any truck-based SUV. It was proof a utility vehicle could meet the demanding needs of an everyday commuter. The Edge is All-New from wheels to roof, designed to reset the standard in the 5-passenger utility vehicle market. Based on Ford’s successful, global midsize vehicle platform, Edge has been reimagined with a stronger, more athletic shape. It has been retooled to meet higher expectations for quality, and reengineered to add more features and technologies for a more rewarding driving experience. “The original Edge was our first entry into the world of crossover utilities – a technologically advanced vehicle that was the perfect blend of sedan comfort and efficiency with SUV functionality,” said Mohammed Al Houssami, Regional Sales Director, Ford Middle East. “With the all-new model joining our popular SUV lineup, we are building on that success and on the emotional appeal of the vehicle by offering more of the technology our customers want in a package that meets the highest expectations for quality and craftsmanship. We are confident the design, sophistication and technologies of the new model will reinforce its leadership in this segment,” Al Houssami added. With the new Edge, Ford is also building on its utility vehicle leadership around the world. Last year, the company sold a record 1.2 million utility vehicles in markets across the globe – up 38 percent from 2012. The All-New Edge is available in four trim levels. These include SE, SEL, Sport and – for the first time – a top-of-the-line Titanium series to meet market demand for more premium offerings. In terms of powertrains, there are three engine options, two of which are new power plants – a standard twin-scroll 2.0-liter EcoBoost® four-cylinder with 253 PS and 378 Nm of torque, and the advanced 2.7-liter EcoBoost V6 on Sport models, delivering 340 PS and 542 Nm of torque. A normally aspirated 3.5-liter V6 engine is also available. All are equipped with a dual exhaust and a SelectShift® six-speed automatic transmission with paddle shifters. The available all-wheel-drive system for the new Edge is full-time, on-demand and seamless – there are no knobs or switches to activate. An electronically controlled clutch, which can engage faster than a human can blink, transfers power between the front and rear axles, sending up to 100 percent of the power front or back. The All-New Edge will be a technology leader for Ford, with a suite of standard and available technologies designed to improve the driving experience and the level of occupant comfort. Technologies being offered for the first time include Ford’s first ever application of adaptive steering, adaptive cruise control and collision warning with brake support, enhanced active park assist, front, rear, and side parking sensors and a 180-degree split front camera. Other key technology features include a hand-free lift gate, lane-keeping system, Blind Spot Information System BLIS®, and SYNC® with MyFord Touch®. The all-new Edge is also loaded with safety technologies, including active glove box knee airbag, AdvanceTrac® with Roll Stability Control™ and Curve Control, and inflatable rear safety belts. Overall, the Edge represents a significant move forward in both material and visual quality. Throughout the vehicle, seams are tighter and more consistent, and the design has been executed in a way that reduces visual cut lines. The dashboard and center console have also been carefully designed and shaped to look like one thin, streamlined piece. A central 8-inch LCD touch screen supporting SYNC with MyFord Touch is now available on even more models. Thanks in part to smart design work and next-generation seats that are thinner and more supportive, the interior of the new Edge is larger and more spacious. Adding further to the feeling of openness, Edge will continue to offer one of the largest sunroofs in the business – Ford’s Panoramic Vista Roof, measuring 121cm front to back. Legroom in the first and second row of the new Edge has increased by 4.8cm and 2.54cm, respectively. Headroom increases by 2.54cm throughout. Cargo capacity increases, with 39.2 cubic feet of space behind the second row of seats – 7.0 cubic feet more than the previous model. With the second row folded, space has increased by 4.5 cubic feet, to 73.4 cubic feet. The new Edge is slightly longer and taller than its predecessor, and the wheelbase increases by 2.54cm, to 285cm. The All-New Edge is not only more luxurious and comfortable, but also quieter. In wind tunnel tests, Edge proved to be more than 1 sone quieter than its predecessor (a sone is a unit used to measure how loud a sound is perceived). This enhanced quietness is due to better sealing of the body, sound insulation improvements, and powertrains that are better isolated from the cabin and operate in a quieter manner. Acoustic windshield glass is standard on every model. Ford Middle East encourages all customers interested in the All-New Edge to visit the Alghanim Auto New Vehicle Showroom in Shuwaikh Industrial Area, opposite from the Classical Car Museum and Sirbb Circuit. The showroom is open from 9 am to 8 pm every day except Fridays. Ford Motor Company is a global automotive and mobility company based in Dearborn, Michigan. With about 203,000 employees and 67 plants worldwide, the company’s core business includes designing, manufacturing, marketing and servicing a full line of Ford cars, trucks and SUVs, as well as Lincoln luxury vehicles. To expand its business model, Ford is aggressively pursuing emerging opportunities with investments in electrification, autonomy and mobility. Ford provides financial services through Ford Motor Credit Company. Ford’s history in the Middle East goes back more than 60 years. The company’s local importer-dealers operate more than 155 facilities in the region and directly employ more than 7,000 people, the majority of whom are Arab Nationals. Ford Middle East is also a responsible corporate citizen with currently three CSR initiatives running in the region including the Ford Motor Company Conservation & Environmental Grants, Ford Warriors in Pink® breast cancer awareness campaign and Ford Driving Skills for Life safe driving awareness programme for young drivers and teens.